The Credentials Management feature of Atrium permits you to track required qualifications of your interpreters to assure only those interpreters who are qualified are shown to be available for interpretation assignments. To use the feature, you must first enable it. You do this in Administration/Maintain Company Settings in the new Credentials Management menu bar selection (below). You have two settings. One which will enable filtering interpreters whose 'Required Qualification' (credential) has expired. If this is enabled, then they will not show as available for a request where this credential has been marked as a 'Required Qualification'. The other setting on the menu item allows you to configure the number of days in advance of expiration that the interpreter will be advised of an expiring credential. This will only apply to credentials which have an expiration date. If they have no expiration date, they are assumed not to expire. The label on the Interpreter Profile tab which was called 'Attributes' is now called 'Credentials Management'. There are no other changes here. Just remember that if you have an expiration date, it will now be evaluated when an interpreter is being filtered/sorted for availability. If you have selected it in Administration/Maintain Company Settings, all required credentials that are part of a request will have to be unexpired for an interpreter to be considered available. In the example above, this interpreter will be considered available as long as 'Annual TB test result' is either required on not required by your client, while if the 'Badge for Main Entrance' is a required, this interpreter will not be considered available since Expiration Date has been passed. The setting in Administration/Maintain Company Settings defaults to being off. This means that the Expiration Date will not be taken into account in determining availability until it is turned on. When turned off, there is no apparent change to way attributes are used determine availability. If you want to use this feature you will need to turn it on. 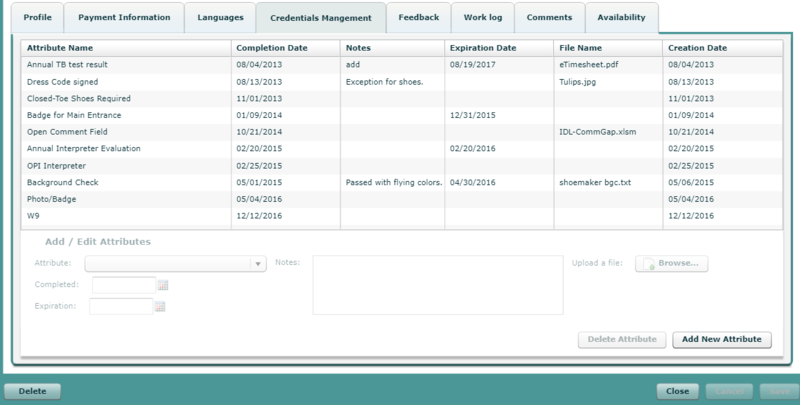 'Missing Required Attributes' - This will give you a list of all interpreters who do not have an attribute/credential where the check box 'Is this required for the Interpreter?' has been checked. 'Expiring Attributes' - This will give you a list of interpreters by attribute/credential with attributes/credentials expiring in the next 90 days. In order to add these reports to you menu, see this article on How to Maintain Users.